If you’ve been coming around here for a while, there’s a few things you’ve likely learned about me. I love to create, I love color and patterns, and I love to plan. Yep, I am planner! 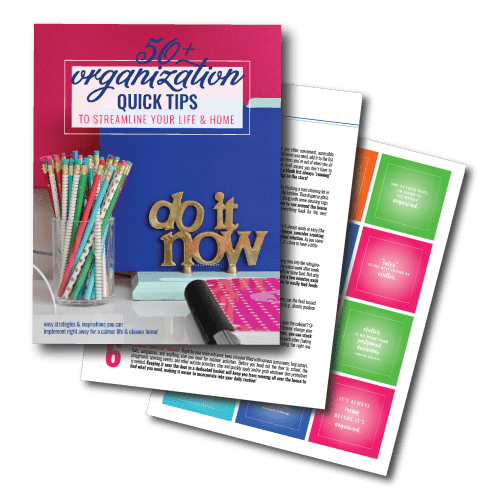 From our nightly meals to my day-to-day tasks, I find that I am able to better manage our household, the blog, and our family fun with a little bit of focused and intentional planning. 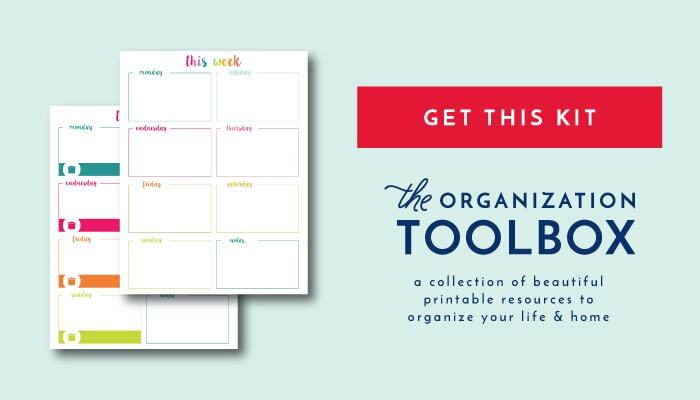 Today, I want to give you a glimpse into how I organize our week, and I’m even sharing some new weekly organizing printables (per many of your requests!) to help you stay on top of your week too! One of my time-honored habits is something I call Task Blocking. I’m not sure if that’s even a real term, but I’m going to go with it for lack of a better one! Similar to the concept of Time Blocking that you’ve likely been reading about all over Pinterest (and even here on the blog! ), the main concept is to assign specific tasks to specific days/parts of the week. 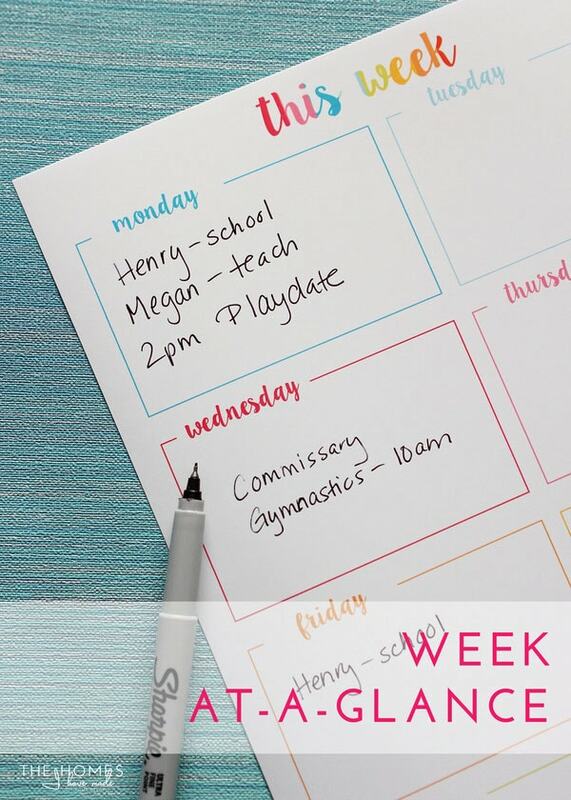 Instead of haphazardly going through the week trying to fit in grocery shopping, laundry, errands, etc whenever and wherever they fit, I assign those tasks to specific days of the week and repeat that same schedule week after week. 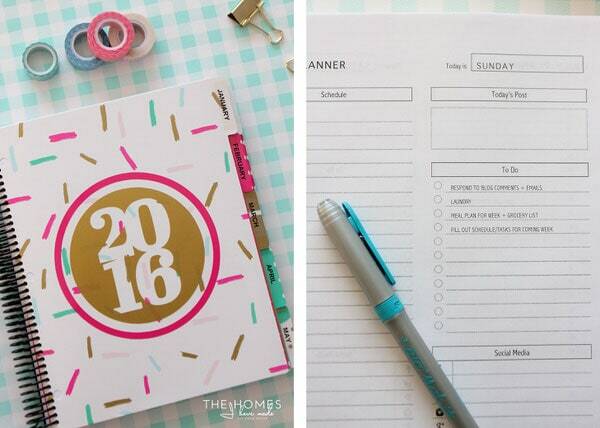 You saw evidence of this a little bit when I showed off my 2016 Planner a few weeks back. You’ll notice on my Sunday schedule (below), I pre-populated the tasks I do every.single.Sunday: respond to blog comments, laundry, meal plan, and filling out my schedule for the following week. Yes…things get bumped and adjusted here and there, but honestly, I mostly stick to my schedule! I’ve found that this approach allows me to work my way through our week without fretting how everything will fit and ultimately get done. 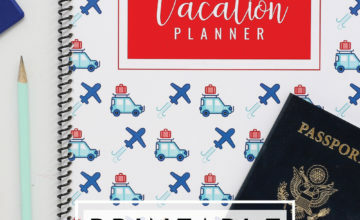 All the major tasks (home, blog, and personal-related) are all loosely scheduled in, so I just hustle through the week and trust my planning will pay off. Admittedly, I keep track of most of these tasks in my planner (which is working out SO good for me, by the way!). 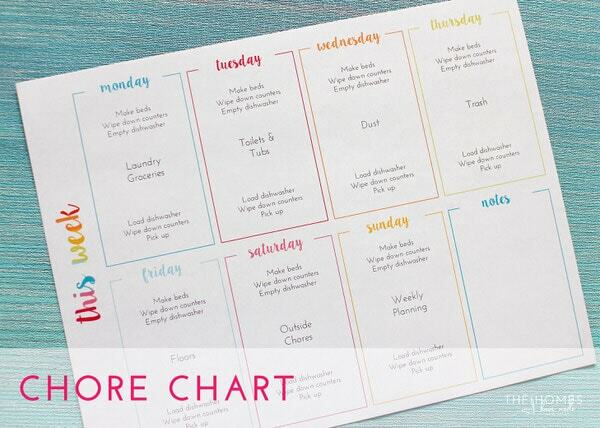 But many of you asked for some printables to help you quickly and easily organize your week, so I was happy to oblige! I’ve created 2 different versions of a weekly spread (portrait and landscape versions of each) as well as some pretty checklists. All are available in a single 6-page download! 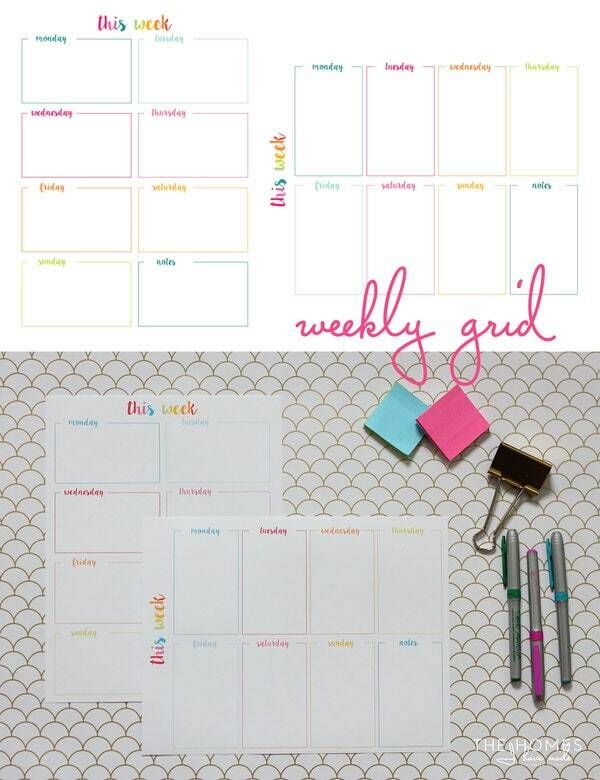 These weekly scheduling printables feature large, wide open spaces for you to write in any sort of information you want/need to track! 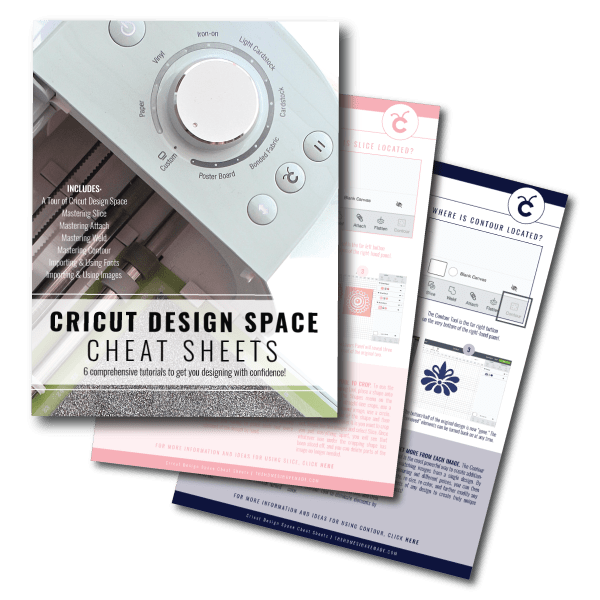 They are ideal for laminating or covering in contact paper, so you can use a dry-erase marker on them over and over again! 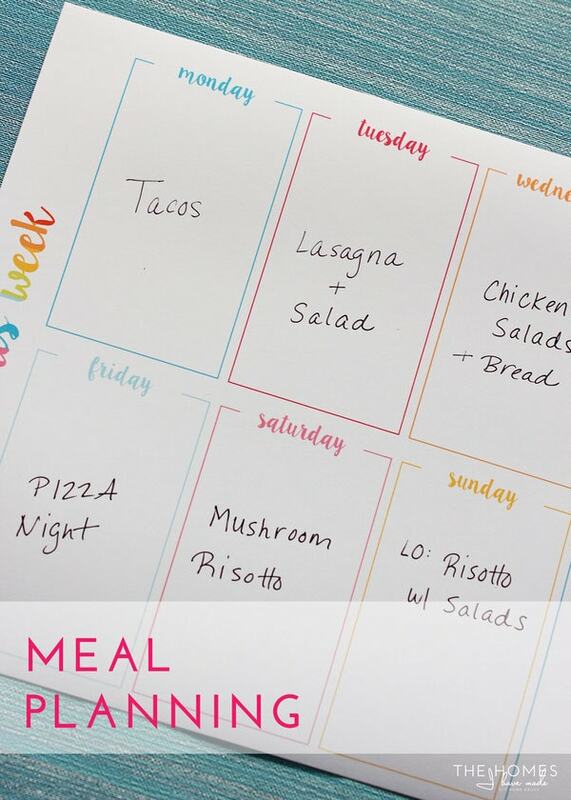 If you’re looking for a single sheet snapshot of your week, this version also has spots for you to write in your meals! 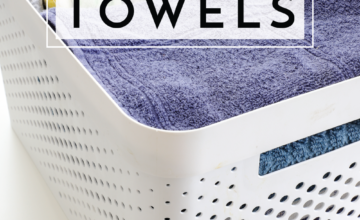 I can think of so many great ways to use these handy little sheets! The first idea is to print out a bunch, keep them pinned up on a bulletin board or your refrigerator and fill them in with your weekly meal plan. 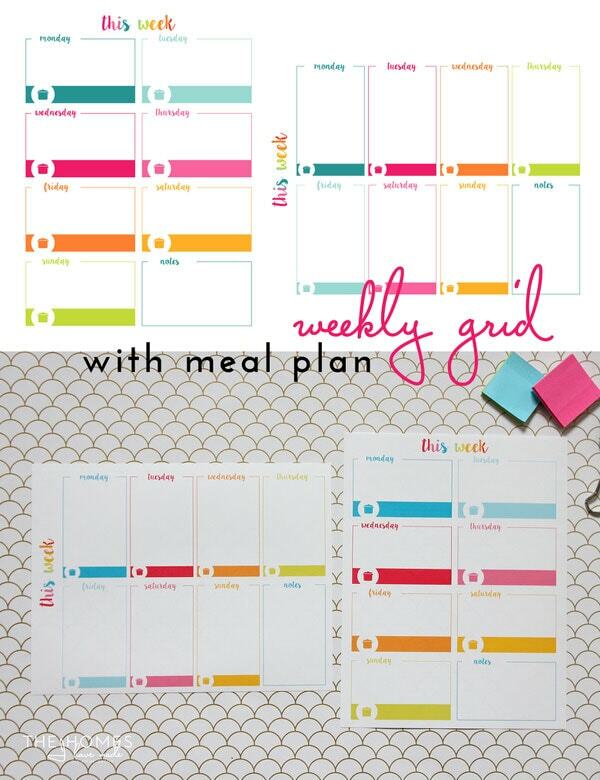 Another idea is to use them as week-at-a-glance sheets. This isn’t intended to replace a planner or family calendar, but rather provide a quick snapshot of the week ahead. When Henry was little, I filled a sheet just like this with all the different story times, play groups, open gyms etc in the area. On any given day, I could look at the worksheet and find what activities were going on where and at what time! One of my favorite ways to use this sheet is to populate the grid with a cleaning schedule, chore chart, or if you have recurring tasks (like I do for the blog) by day. 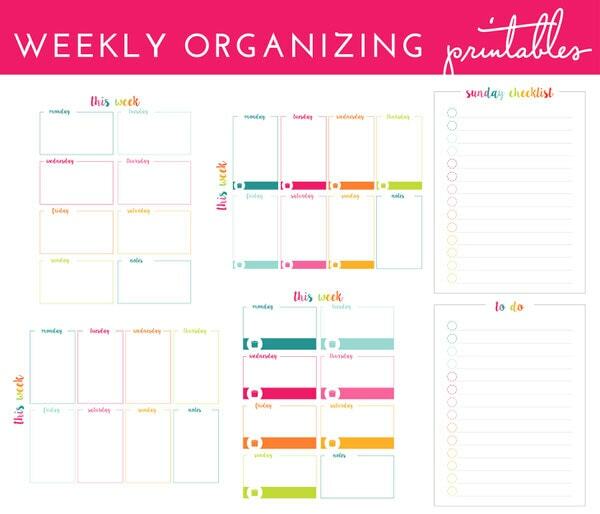 While I was at it, I went ahead and designed a basic checklist that match these weekly organizing printables! Sunday is a big day around here, as we do laundry, meal planning and really get set for the coming week. 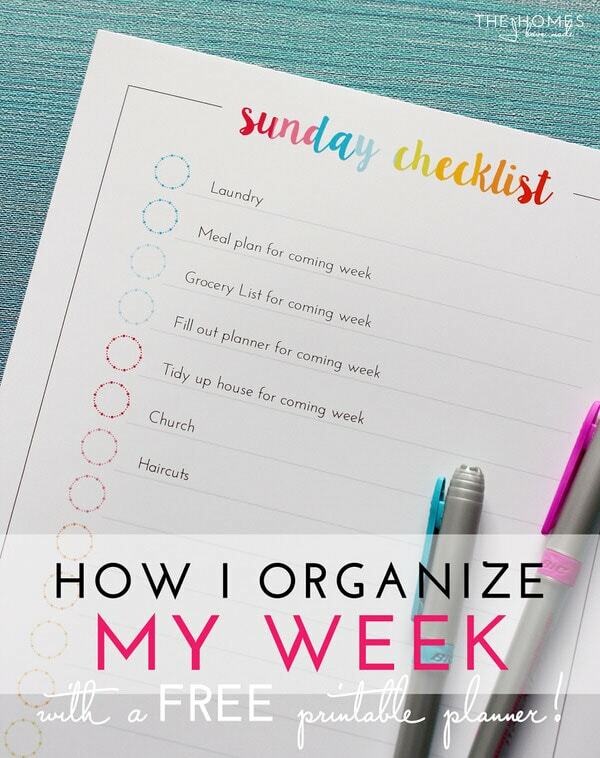 As such, I also made a dedicated Sunday Checklist and included it in the printable pack. I populated my list with all of our usual Sunday tasks. As I do with most things, I laminated it and now have it up on our refrigerator to check off week after week! These are just a few ways I could think of to use these sheets! You guys always have such great ideas, so I’d love to hear if you have any fun and unique ways to put them to work. Share your ideas in the comments below! 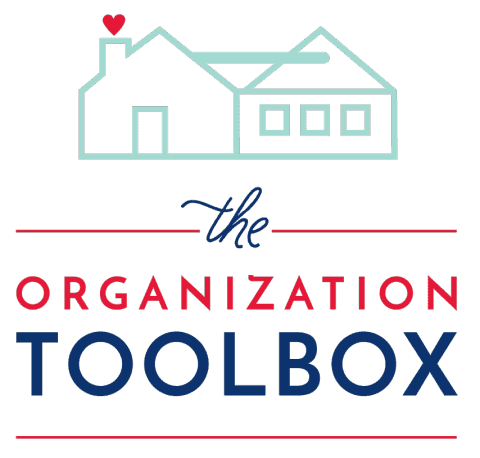 This Weekly Organization Kit has been uploaded to The Organization Toolbox and is available for download right now! I hope your week is off to a great start! See you back here on Thursday with a quick and simple sewing project! This is so perfect for me. I need something that allows a week at a glance, I can haul with me in my little purse, and still be able to keep up. I tend to do well with the monthly calendar on my phone, but my weeks just get lost! My kids don’t know it yet, but the checklist will be a chore chart for them. Laminated of course. Thank you so much! I can’t wait to print these out and put them to good use. 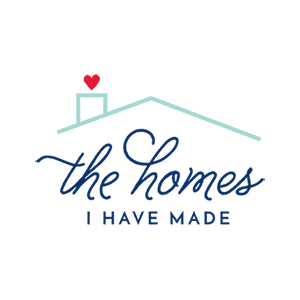 And to think I almost didn’t make these…I am so glad to hear everyone is loving them so much! I hope they work out for you! 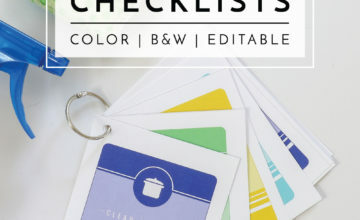 Keeping them in your purse and using them for chore checklists are both awesome ideas! For those of you who are wondering…I’m trying to get date night on the schedule somewhere between groceries and laundry. 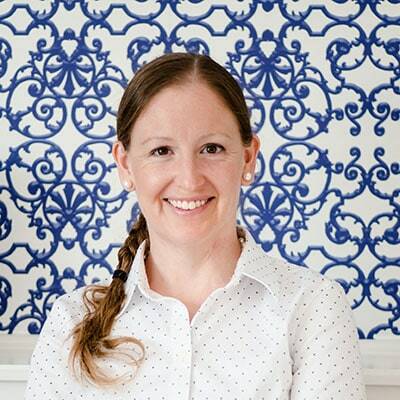 Hi Megan — technical note: I have to clear my browser history to visit your site otherwise I won’t see your latest post, I’ll just see what I saw last time. This happens with both Chrome and Internet Explorer. I don’t have this issue with other blogs though (and I check some on WordPress and some on BlogSpot). So maybe there is a setting on your end? Thank you so much for your note. It’s not you, it’s me! I installed a cacheing service to help with site speed, but it unfortunately had the result of return visitors not seeing my most recent posts unless they refreshed their browser (myself included). That’s obviously no good, so I recently made an adjustment in the settings which was supposed to fix it. On all of our computers and mobile devices, my most recent posts now show without having to refresh or clear any browsers. I’m making myself crazy trying to figure why and how it’s working for some and not others. Can I ask you a favor? I have a post scheduled to go live tomorrow. Can you visit the site directly tomorrow and let me know if you can see the new post WITHOUT refreshing your screen? I thought I had it all fixed, but maybe not. Thanks for the heads’ up and your help! Megan,Icant download tours freebies because needs a passoword. I subscreve my email but the password dont. Thanks for writing! The password was included in the final confirmation email when you subscribed (in a big blue box), as well as the most recent newsletter. I checked the mailing list and you are on it…so be sure to check your Spam/Junk/Trash folders and mark them for your inbox. If for some reason it didn’t come through or you can’t find it, please let me know! Thanks! Thanks for writing! The password was included in the final confirmation email when you subscribed (in a big blue box), as well as the most recent newsletter. I checked the mailing list and you are on it…so be sure to check your Spam/Junk/Trash folders and mark them for your inbox. If for some reason it didn’t come through or you can’t find it, please let me know!